Genie DPL Super Series is a cost-effective two-worker lift option. These versatile machines combine tight access maneuverability with ample space for two workers and their tools on a large platform. They offer exceptional stability with a patented aluminum mast system, heavy-duty lifting chains and welded steel base that stands up to rough jobsite conditions. Bottom line, they're the ideal choice for big jobs in small spaces. 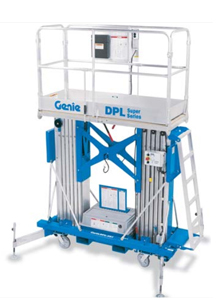 Genie DPL is large platform with room for up to 2 workers and tools. Genie DPL is quick to set-up and simple to operate. Genie DPL platform-mounted GFCI 110 V electrical outlet standard on all models. Genie DPL is non-marking swivel-lock casters for 360˚ rotation in small spaces. Genie DPL is convenient handle for easy steering and maneuverability, even through standard doorways. Easy transport with multi-directional forklift pockets, outrigger storage sockets and sturdy tie-down attachments points.